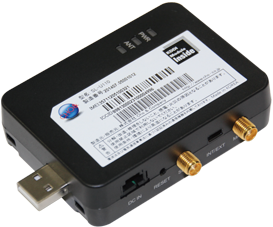 Communication module KYM11 compatible with KDDI 4G LTE. Enables you to enjoy rapid Internet, reaching up to 75Mbps. Contains an LTE antenna, and a GPS antenna inside. Compact and cheap, but containing high grade equipment. This adaptor can be used for many purposes such as remote observation or control of industrial equipment, LBS, field of security, operating control of bus and trucks, etc.. This product can be used in variety of fields such as remote observation/control, management of location information, etc.. Covered areas Covers a whole part of Japan using KDDI’s LTE networks. Internal antenna LTE and GPS antennas equipped. However, external antennas are also fixable depending on the purposes. Light and small Compact shape and light weight (only 68g), with antennas inside. ２ways of charging Compatible with USB bass power and external battery charging. Usable under variety of environments. Compatible with DC4V～24V. works even under temperature of 20～+60℃. ※devices based on USB2.0 need external battery charging.